How do interiors define boutique hotels? When you think about 'boutique hotels' you will most likely imagine a place full of style and sophistication. A boutique hotel should be individual and should rely upon its image and its design ideas to live up to its reputation. It will be small and stylish and should leave visitors with a sense of relaxation and satisfaction. The size of a Boutique hotel is normally 10 to 100 rooms. Anything smaller than 10 rooms would be classed as a B&B or an inn. People often expect boutique hotels to differentiate themselves from the others in some way. The main way to achieve this is through interior design. There are many different ways which you could approach design and colour themes. A common trend with boutique hotels is to create a different theme for each room, allowing guests to choose their preferred look. This helps to ensure that guests will be pleased with the décor, an important part of building the feeling that the hotel is superior to competition, and that the stay is a memorable one. When planning your design, always make sure you use what you already have and work this into your plans. For example if you have beams, you need to consider these and might even choose a theme based around them. If the beams are dark brown wood, see if you can match to this in the forms of mirrors and furniture. Work this in with other features and create the look that works. You may be working with a listed building and there may be certain features which must remain. You can use these to your advantage and work them to create that unique look that so many hotels fail to achieve. 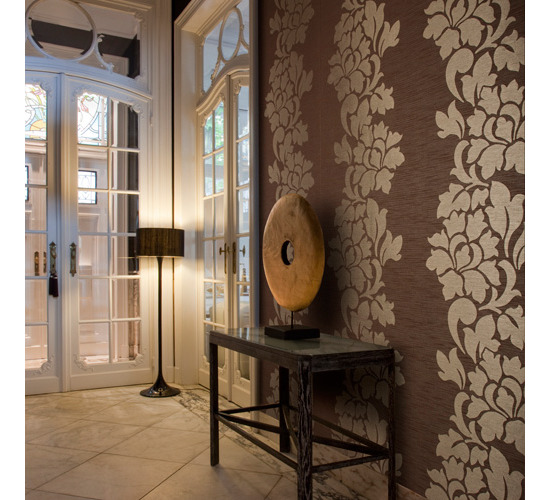 Another good starting point is your wallcoverings. Wallcoverings can be the centrepiece to your room and the eye can be drawn to a stylish wall. You can use a feature wall to give a room its character and to add level of class. Accessories and furniture can then work with the walls to create the desired effect. 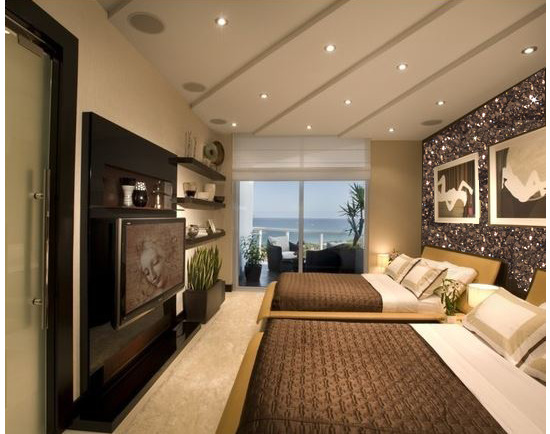 Wall panels are often a more luxurious option when it comes to your wall décor. They can be made to work in a variety of rooms such as dining rooms and bedrooms. Through their texture they add an extra dimension and a real focal point to a room. A very neutral colour palette is evident in the main image; however as you can see, even with very simple furnishings and neutral colours, the use of stylish and modern wall panels can upgrade the entire room. A similar example we have is the use of glitter wallpaper. This standout trend is becoming increasingly popular and adds a touch of glamour to any room. The use of cream and brown has been used below: a simple colour scheme that embodies a fairly minimalistic look. However with the addition of eye catching wallpaper, the room is given some character - becoming more memorable and unique. When it comes to the communal areas, be careful not to neglect their importance. The dining area should be arranged and decorated to give a customer a relaxing place to enjoy an evening meal or breakfast. Even the reception area needs to keep up the pace when it comes to style and you may find larger spaces such as these will make good use of bolder patterns. Large flower patterns will catch the visitor's eye and create an effective backdrop to your rooms. It is important to find ways to stand out from the crowd, whilst maintaining the chic, modern and sophisticated ambiance that is expected from a top class boutique hotel. Try not to make it too personal - going by personal taste will not work here - and if you are aiming to keep colours neutral and appearances minimalistic, find ways to add character and bring life to the space.